1) My family! My favorite times of day are when we're all together! I love my Hubby and two girls more and more and more every day! 2) Our new house. It's smaller than our last house, but it fits all of our family's needs just fine! Plus, there's less to clean with a smaller house! I am really having fun dreaming of how I'll be decorating each room here!! 3) The rain. Coming from North Carolina where we had to deal with drought and water shortages the past couple of years, it's nice to enjoy the soft rain showers here in the Midwest! Green grass is such a blessing! 4) The girls' new school. We visited their new school on Tuesday, and they are so excited to go there in the fall! We also feel blessed that they will be getting a Christian education and that the Lord provided the resources for this to happen! 5) My lists. I am a serious list maker! I have several notebooks and lists going, and without my trusty list to refer to I'm sure I'd forget 90% of what was in my head to begin with! :) So since I feel extra scatter-brained right now, I am thankful for my lovely, wonderful lists! 6) My "stuff". Believe it or not, I am thankful for my "stuff" right now! I have furniture enough for the time being to furnish our entire house (another benefit to downsizing! ), and what "stuff" is left over will be sold and the money go toward any new improvements we might make. 7) Green plants. I have 2 plants (a fern and a peace lily plant) that survived the move here and I love seeing them in my home! Plants really add some "life" to a room! 8) Chapter books. I've been reading a book series to my girls, a little every afternoon after lunch. Even though the girls are old enough to read these books on their own, I love getting to snuggle them on the couch as we read together and enjoy the story! Hopefully they will remember these times as fondly as I know I will! 9) Friends! I have loved getting to see friends both old and new during these past few weeks!! What a blessing a good friend is! :) I am also thankful for all of the friends that I have in YOU! I have truly found the blogging community to be a supportive, caring, & fun group of people and I feel honored to call you "Friend"! 10) Ice Cream :)! Seriously, what could be better on a summer day? Or evening? Or any day of the year for that matter?!! Hehe! Ice cream makes anything better, right? I am especially partial to DQ's Snickers Blizzards lately--Yum!! And I'm thankful that there are 2 DQ's here in town for me to be a frequent customer at! I am SO excited about my Master Makeover, I can't even tell you!! Remember the blah BEFORE pic above with it's not-so-pretty, really brownish-orange in real life wall color? It's the softest greyish-blue color and I ADORE it! I already had the white bedding, too, so that was easy-peasy to add! Step 1 in my Master Makeover is now complete! Oh, yeah! Both Hubby and I LOVE the look of this room, and will be referring to it often for our Master Makeover Re-do!! Have you ever found a picture you loved and used it as decorating inspiration?!? and painting our master bedroom! Notice all of the peachy-orangey-brown paint. It's much yuckier looking in person, let me tell you. Our moving van arrives tomorrow, and our bedroom furniture is SO heavy that it was really easier to paint the room now, before the furniture gets here. Well, it's now the most lovely shade! Can you guess what I went with?? I'll show you the "After" pictures nest, oops, I mean NEXT time! Hi there! Just wanted to say "Thanks!" for bearing with me during our move! :) We are officially moved out of NC, and are staying a long weekend at my parents' house before moving into the new house in IL!! Oh.my.good.golly., I'm exhausted!!! I don't think we'll be moving again for a very very very long time :). But I'm SO EXCITED to show you the new house! Actually, I'm just excited to see it for myself! hehe!! Did I tell you that only Hubby has seen the house & not me?? Yeah, I know I'm crazy :)! It's going to be very different from my NC house, but I know that I can make it a great home! 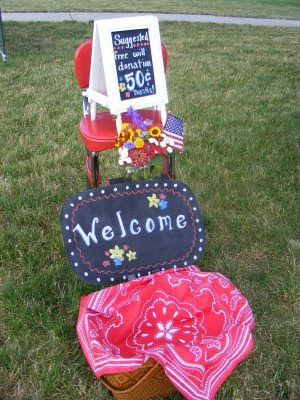 You'll get the benefit of seeing lots of decorating makeovers going on!! I'll still be posting during this next week, even though it may not be every day. So keep checking back! 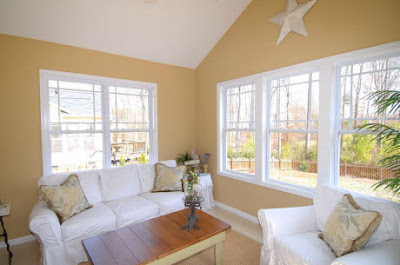 Today I'm sharing with you the cost of decorating my Sunroom! I'm glad I have pictures of this room already, since it's all boxed up now, ready for our move :)! This room really reflects how I decorate, with objects at all different price levels from FREE to more EXPENSIVE. I may have gotten some great deals on some things, but am not afraid to spend some money on items that I feel are worth it. Let's get started Pricing My Space! Barn Star: $50 -- I love this barn star! It is HUGE, and looks great hung high on the wall in this room! It was too similar to the wall color when I bought it (Duron's Tobacco Road is the color, BTW), so I spray painted it Heirloom White. Couch and Chair: $FREE -- Broyhill furniture given to me for free from my sister when she was upgrading her own furniture! Yahoo!! I'm always happy to take free stuff! There's also a matching ottoman, not used in this room. White Slipcovers: $FREE -- A Christmas gift from my parents. But if you love them, they are from Ballard Designs. I tend to ask for decorating stuff for gifts a lot! :) It really helps my budget!! The Pillows: $??? -- I can't remember exactly what they would be....I bought the inserts from Pottery Barn (did you know that you can just buy inserts there without the pillow covers?) because they are a gloriously large size which I love! I made the covers myself with a remnant fabric, and the fringe trim came from a fabric store. The Antique Scale & Cloche: $60 & $24 -- I lovelovelove this piece! Talk about a statement piece! The cloche miraculously fits the top of the scale perfectly! Underneath of it is a green depression glass plate that was $1 at a garage sale, and a rusty garden fairy that was $8. An antique French key hanging from the end was $8, and the nest greenery on top was only around $3 at Michael's. Linden Glass Tray Table: $around 50 -- I paid only 1/2 price for this Southern Living at Home table when I hosted a party several years ago. I've used this in several rooms in several homes and it's great anywhere I put it! Coffee Table: $200-something? It's a Broyhill table, and was discontinued, we got it at their NC warehouse for a good deal less than it retailed for. Sisal Rug: $FREE -- again, a gift a couple of years ago. It's from Ballard Designs, if you're interested. Black & White End Table: $22 -- From a flea market years ago! It's a sewing machine bottom, and a white chippy shabby painted top. Love this!! The birdhouse on it I bought from the artist at a different flea market for $50. It's huge, and an original!! Other End Table: $??? -- Just a cheap plywood decorators table covered in white linens I already had. Potting Bench: $55 -- From an antiques mall. It perfectly fits this little wall! The wire thingy I added to the backside was $16. The accessories on here have been in my collection from through the years, and I don't remember all the prices. Wood Architechtural Piece Over Door: $34 -- From flea market, and a favorite piece of mine! Pretty good for furnishing an entire room!!! Thanks for visiting :) I hope you enjoyed the tour of me Pricing My Space!! Leave me a little comment to say hello! 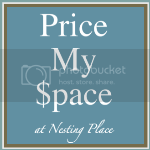 Go visit Nesting Place by clicking on the button above to see more Price My Space tours! ......That Are "Key" To Decorating Your Home! Everyone has items that are "must-haves" when decorating their homes. You know, the little things you just couldn't live without, your very favorites, the items you are drawn to over and over and over again!! 1) Mirrors--They add so much depth and sparkle and beauty to any room! One of my very favorite things to hang on my walls!! 2) Chalkboards--Oh, the love I have for these pretty beauties!! I have a huge one in my kitchen, and smaller ones sprinkled in several other rooms! Perfect for fun messages & I honestly love the look too -- the touch of black looks great anywhere! 3) Botanical Prints--One of my joys is being in the garden, and botanical prints hung as art brings some of the garden inside! Flowers, ferns, and even (though not botanical) old prints of eggs or shells too. Stick to one topic (just ferns, for example) and group 6 or 9 together for a great effect! 4) Family Photos--While some decorators say that one shouldn't have family photos displayed in the main rooms of their home, I say "Phooey!". To me, family photos make my home feel like HOME! I love the look of photos going up a staircase, or sprinkled with books and other objects on a bookshelf, or grouped on a wall of similarly framed photos over a couch or bench. 6) Items From Nature--Bird, nest & egg things are definitely sprinkled throughout my home!! But I also like to have shells & starfish, pinecones, fresh flowers from the garden, a bowl of fruit, pretty houseplants, etc used in my decorating. I bring things in or out according to the seasons, and it adds a beautiful touch from the #1 Creator Himself that I love! 7) Great Lighting--Nothing worse than a dimly lit house! Get some fabulous lamps, pretty chandeliers, & lovely sconces! Candles are beautiful too! Say "NO" to florescent lights or rooms without lamps. The best lighting makes an effort to have your room be beautiful whether turned on or off. 8) Fabulous Fabric--Gorgeous fabric makes me weak in the knees! :) I tend toward neutrals for much of my upholstered furniture. I love white slipcovered furniture!! It's the accent fabrics on pillows and window treatments that make my rooms pop with personality! I am SO looking forward to choosing fabrics for my new house, I can't even tell you!! 9) Glass Items--I have found through the years that I gravitate toward glass items. Hurricane vases, cloches, lamp bases, lanterns, cake plates, etc. I like the sparkle of the glass especially, and think these items work well in small spaces since they let the light shine through! 10) Original Artwork--I personally like the items hung on my walls to be unique and special. Some of the items listed above fulfill this desire, but I also like empty vintage frames, silhouettes of my children, & kids artwork too. What Would Make YOUR Favorite "Must-Have"
I've been daydreaming like crazy about the new house! I thought I'd share some inspiration pics from my files with you :)!! 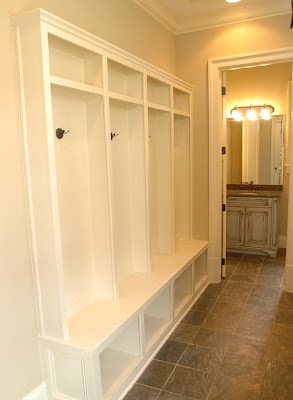 I dream of lockers like these in a little mudroom!!! This kitchen is very similar to the layout of my soon-to-be new tiny kitchen. Love the creamy-white glass front cabinets, wood floors, and matching roman shade and curtain panels! Could this bedroom be any prettier?! Just gorgeous! And so ME with the brown toile (which goes so nicely with my love of brown transferware! ), white matelesse, monogrammed pillow, and pale grey-blue walls. 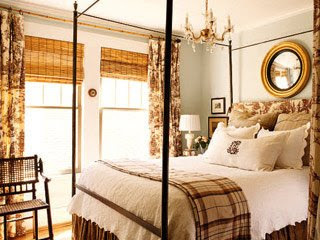 Hubby and I dream of an antique chandelier in our bedroom...too romantic!! I don't know about you, but Hubby and I are NOT super formal people! We dream of a dining room that is elegantly simple. Perfect for a holiday meal or a fondue party with friends and kids alike! The panelling is fabulous, and the colors used are divine! 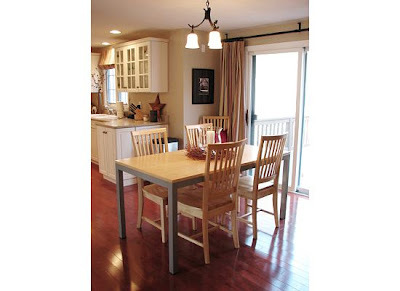 and the lighting fixture with the drum shade makes this space seem comfortable and approachable! Ooooh, now you know I just *lurve! * me a great big chalkboard! Remember the big one in my breakfast room here? A perfect mix of nicer and casual....a great family space! So pretty for a guest room! I have the botanical prints to hang above, and I'm thinking that a soothing color like this on the walls would make a welcoming space for guests! Makes me feel all peaceful! Such a great family bathroom! Again, I'm loving the colors :)!! The numbered towels are my favorite thing! I just love daydreaming about how to put "my stamp" on my home! I can't wait to show y'all pictures of the new house after we close there! Boy, oh boy, will there be some "before and after" posts going on!! LOL!!! Here's to daydreams & blessings that come true!!! Remember my Fun Chalkboard Paint Project?? I was thrilled to have Leigh Ann from Leigh's Life send me a link to her blog where she showed her version (see picture above) of not only this Chalkboard Paint Project but 2 others!!! Leigh Ann had a beautiful spread set out for members of her church on Sunday morning, and can I just say that it is TOO CUTE!! This would work great for a backyard BBQ or neighborhood potluck as well! Thanks for sharing with us, Leigh Ann! 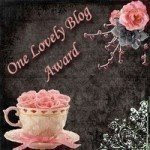 Also, a big Thank You to Naturally Jules for this "One Lovely Blog Award"!!! The homemade sausage, egg & cheese biscuit that Hubby made me for breakfast! The beautiful, sunny, blue-sky day outside! An amazing Hubby who I love more & more with each passing day, & 2 wonderful children who brighten my day with their hugs and "baby-kisses"!! That everything seems to be moving in the right direction for our house closings. That I am around 75% finished packing! Whoo-hooooo!!! Today I'd like to share my nephew's bedroom with you! My sister did an amazing job of making a small-to-average-sized room work and live large!! A perfect example of how a smaller space can be stylishly organized! My sister and bro-in-law decided to do a gender neutral nursery theme. They chose buttery yellow, sage green, and white for the main colors, with the idea that they could add navy blue or pink to the mix when the baby was born! They also added a little lamb "theme", with a few lamb accessories & it's SO cute!!! The key to a child's bedroom being organized is to make sure it remains clutter free! When your child outgrows clothes get them out of the space: either put them into a bin in the attic for your next child, or donate them to someone who could use them. If toys are in this space, go through them regularly & only keep the ones your child loves and plays with often. Make sure everything in the room has a "purpose". Think "outside the box" for extra storage options! Make sure to maximize the storage you do have. 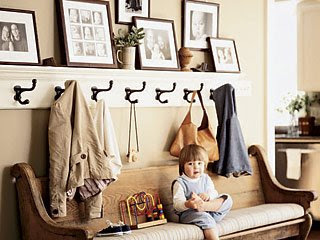 Install inexpensive closet organizers, or at least add a lower clothes rod that your child can easily reach. Don't forget about storage under the bed! A great spot for off-season clothing or storing special artwork and school papers. Teach your child how to make their own bed at an early age. Also to put dirty clothes in the hamper, and toys on the shelf. As a parent, Don't aim for perfection, just general neatness. If they are very young, have them "help" you. This teaches responsibility! :) They will be learning skills they'll need throughout their life, and will feel so proud of themselves! The dresser doubles as a changing table, and she put another small dresser into the closet for additional storage. A waste pail and hamper right next to the changing table/dresser make for easy disposal of diapers and dirty clothes. A basket next to the changing pad holds diapers, wipes, and ointments, along with a little hairbrush and lotion. It's so easy to get my nephew ready for the day! Everything here has a "purpose" and is used daily. The rocker was perfect for nighttime feedings when he was a baby, but now that he's a big boy of 2 years old it's still used every night for snuggles, prayers & songs before bed! It's also easy to read books with your child this way! There is the most darling, soft rug in the center of the floor for playtime! And it's easy to find and put away the books and a few toys that are on bookshelves nearby. My brother-in-law added this wonderful molding around the top of the room for some architectural detail. The soft green paint color really draws the eye up! :) As easy as molding strips and little blocks for the corners on the ceiling. 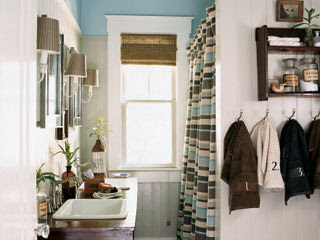 A hook on the back of the door can hold bath towels or a robe. My sister made little fabric & ribbon covered memo boards, and attached one to each of the closet doors. This is perfect for little photos of loved ones, artwork from school, birthday cards, etc. I hope you enjoyed the little "tour" of my nephew's bedroom! "Organizing 101" a weekly feature! We'll go over all of the spaces and places you've had questions about, choosing one (or part of one topic!) each week! !